Experience Cosmo’s advanced skin exfoliation with the goodness of aloevera, fruit, gold and apricot that not only removes impurities from deep underneath, but also imparts a healthy firm glow. 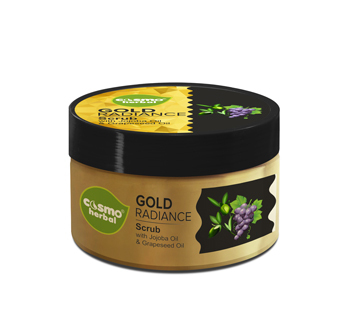 Cosmo’s Gold Radiance Scrub has active nano granules to wipe away dead cells from the skin surface. Whereas the gold content helps to restore the skin moisture and keep it rejuvenated. Apply it regularly for a soft, smooth and supple face look that shines throughout the day. Gold when used as skincare helps in transporting oxygen molecules directly to the skin cells. Besides, gold also help keeping the skin free from acne due to its anti-bacterial traits. 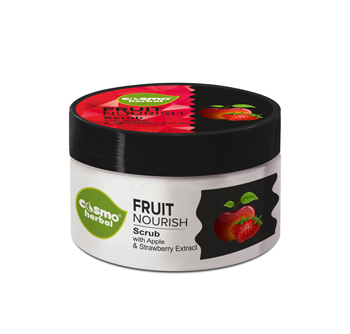 Scrub away all the dirt and toxins from your skin with CosmoHerbal’s specially formulated Fruit Nourish Scrub refined with extracts of strawberry and jojoba oil. Pamper your skin daily with it and you will see a healthy glowing skin smiling at you in a couple of days. Endowed with a rich supply of salicylic acid and vitamin C, strawberry helps in maintaining the natural oil balance of the skin. Besides, it also gives an extreme cleansing effect by removing the dead skin cells. 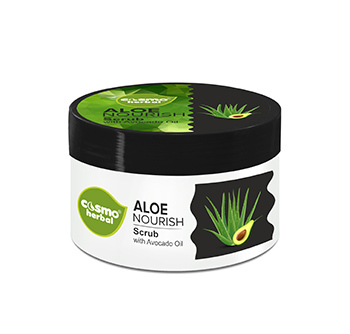 Indulge your skin in the cleansing therapy with Cosmo Herbal's Aloe Nourish Face Scrub. Apricot and avocado oil enriched scrub deep cleanses your skin from within its pores while removing dirt and impurities leaving your skin feeling breezy fresh.